He’s everyone’s favourite dinosaur and proof that national treasures sometimes come in unusual guises. Like a true old friend he’s even made the effort to come and see us so that we don’t have to pop down to London to gaze upon him in the Natural History Museum. He’s 105 foot long, he loves to cross the Atlantic and catches the eye of royalty. 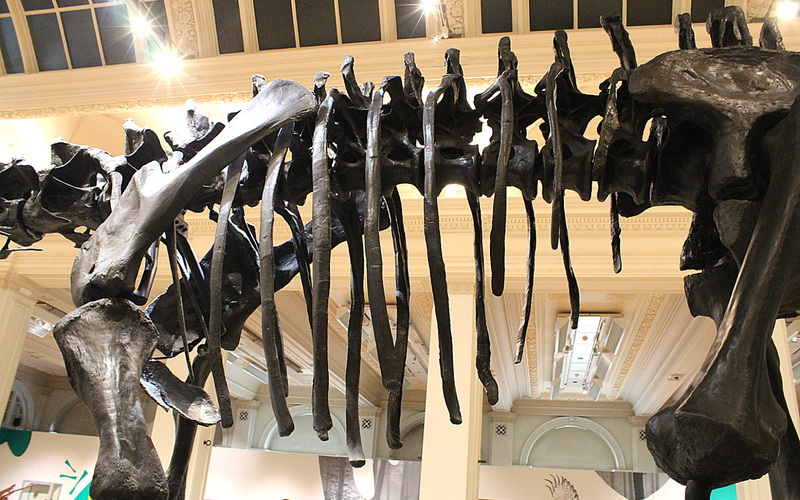 He’s a giant, he’s iconic, he’s Dippy! 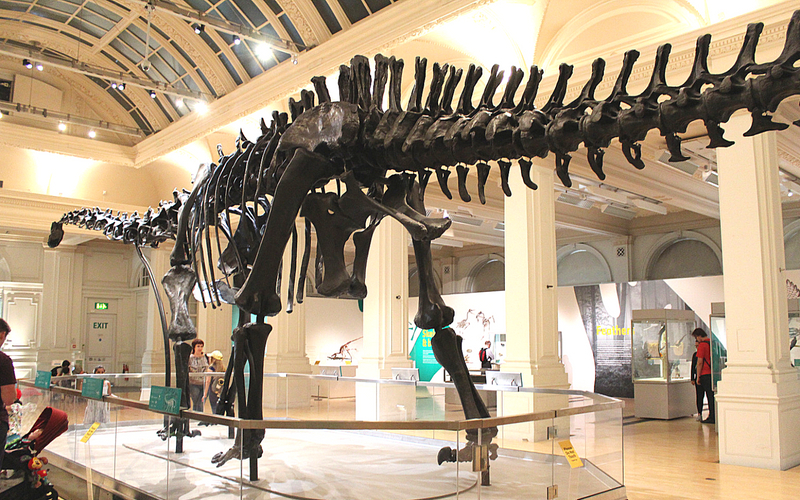 Dippy’s looking incredibly splendid inside Birmingham Museum & Art Gallery’s Gas Hall but you only have until September 9th to see him and it would be a foolish mistake if you don’t. 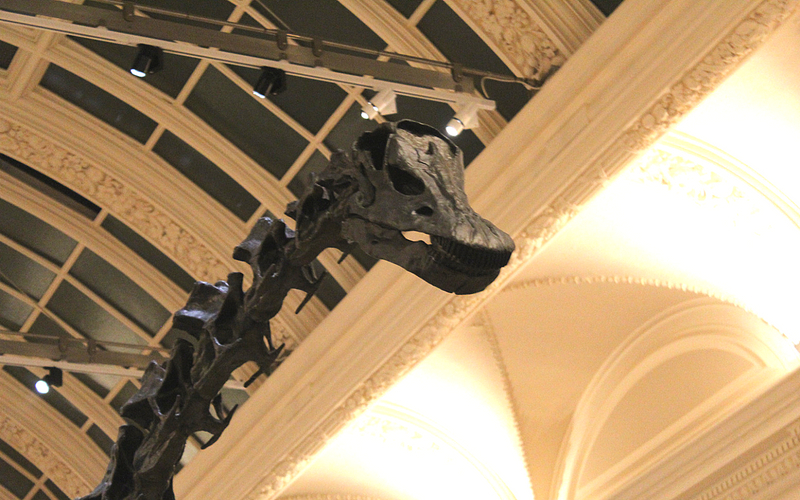 Dippy is free to see but worth booking in advance if you’re going at a busy time. It’s amazing to think that he was discovered in Wyoming way back in 1898. Looking up at his noble skull, which is 4.25 metres high, you cannot help picturing him walking around America 150 million years ago at the end of the Jurassic period, stripping branches from trees, standing up on his hind legs to reach those juicy top leaves then hearing the massive thud of his feet slapping back on the floor. 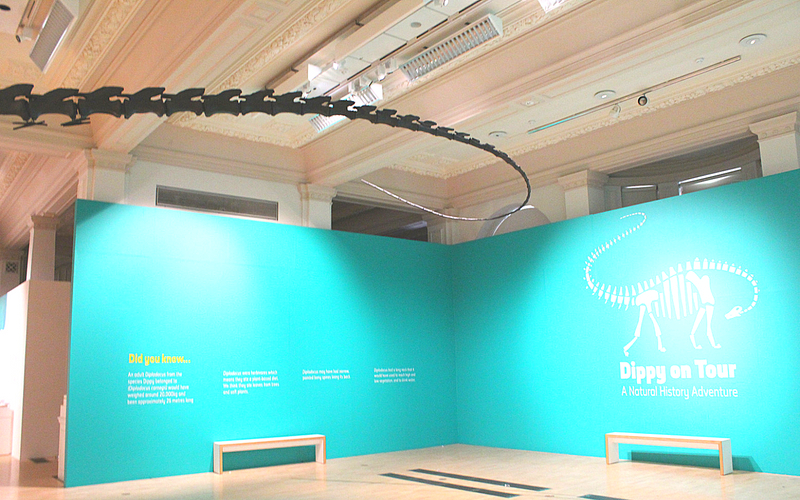 We were delighted to join the Curator of Natural Science, Lukas Large, for a tour of Dippy and the exhibition. 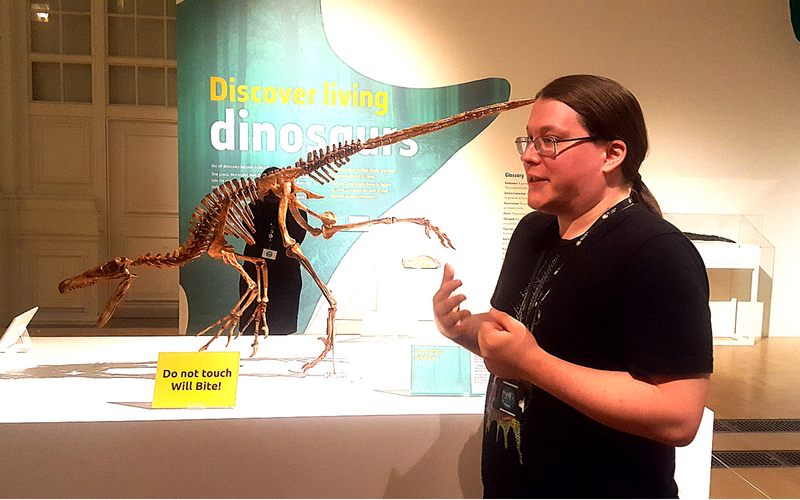 Lukas told us of the hunt for dinosaur bones in the late 19th century in an area famous for its high dinosaur concentration and that Dippy is a sauropod dinosaur known as Diplodocus carnegii. Lukas explained how the ‘carnegii’ of his name was a tribute to Andrew Carnegie, as both a thank you for financing his purchase and a bit of ego flattering in the hope of securing more funding for future projects! 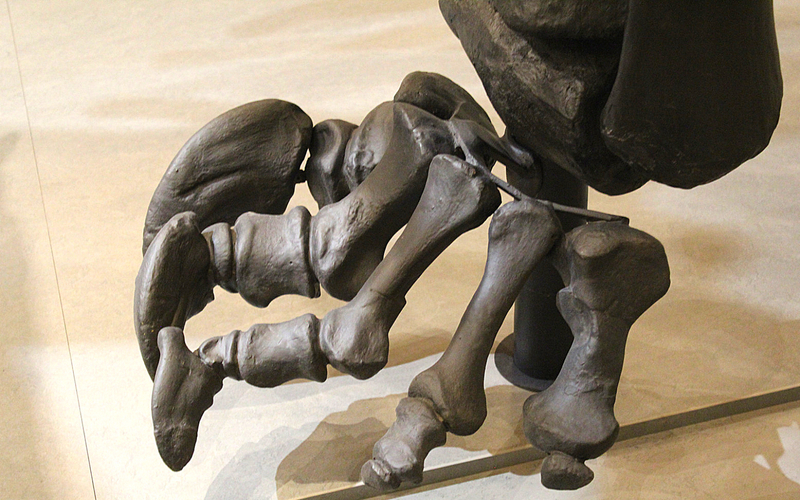 As a giant herbivore, Dippy would have needed to eat a considerable amount of plants and leaves every day to fill this gigantic belly. 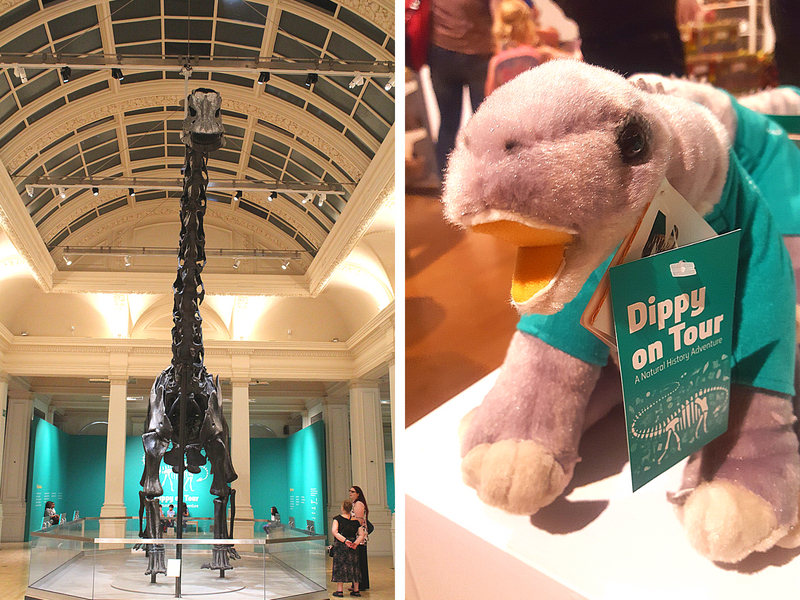 Lukas also told us how Dippy had been repaired since being dismantled in London with his feet, for example, receiving a much-needed makeover in Canada before he began touring the UK. We also found out that his tail was originally thought to trail behind his legs close to the ground until research in 1993 concluded that his tail would have stuck out straight behind him. Before his tail was lifted higher there were stories of visitors to the Natural History Museum stealing the last vertebrae of his tail as a personal souvenir! 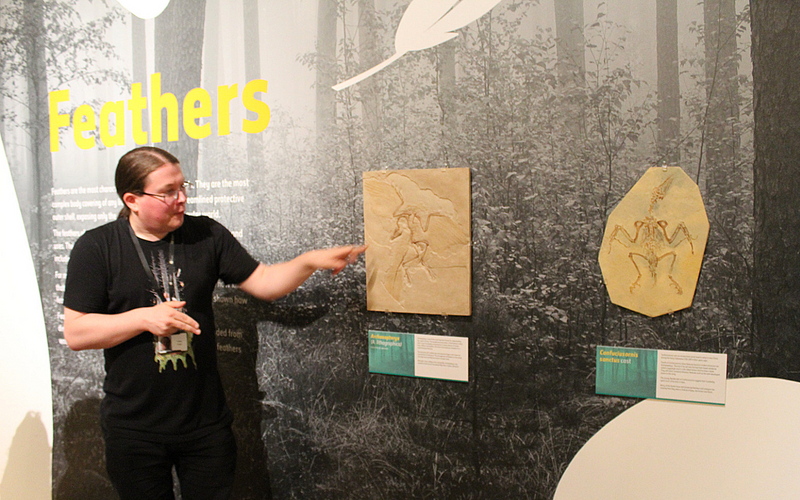 A really exciting part of the tour was when we headed over to the velociraptor display as we began to explore the evolution of birds from dinosaurs. Velociraptors belong to the meat-eating theropod family of dinosaurs that were around 75 million years ago as opposed to Dippy’s 150 million years ago. As you can see, they are much smaller than those terrifying beasts chasing after the kids in the original Jurassic Park movie. Lukas described how velociraptors would not have had hands like in Jurassic Park that could grab as distinctly in that movie as their wrists are much less flexible. 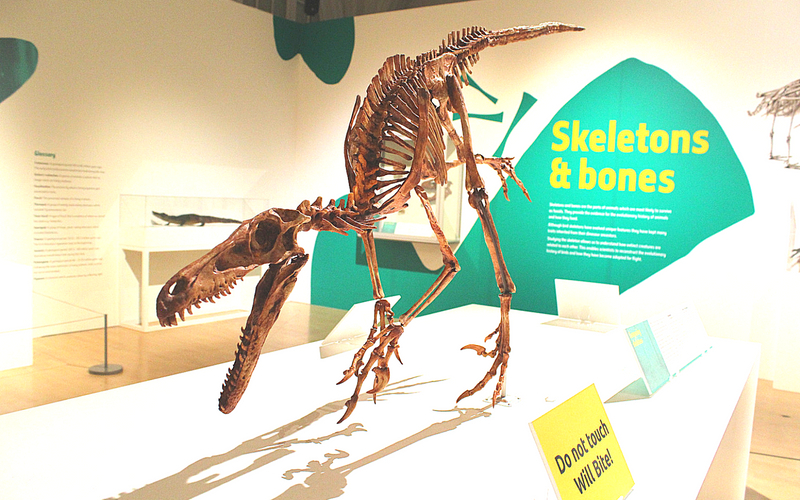 Many bones in birds nowadays have fused together over time to make their skeleton both lightweight and sturdy. Theropod dinosaurs did have feathers however and this is a key piece of evidence that birds are descended from dinosaurs as it is extremely unlikely that something as complex as feathers would have evolved in two unrelated groups of animals. 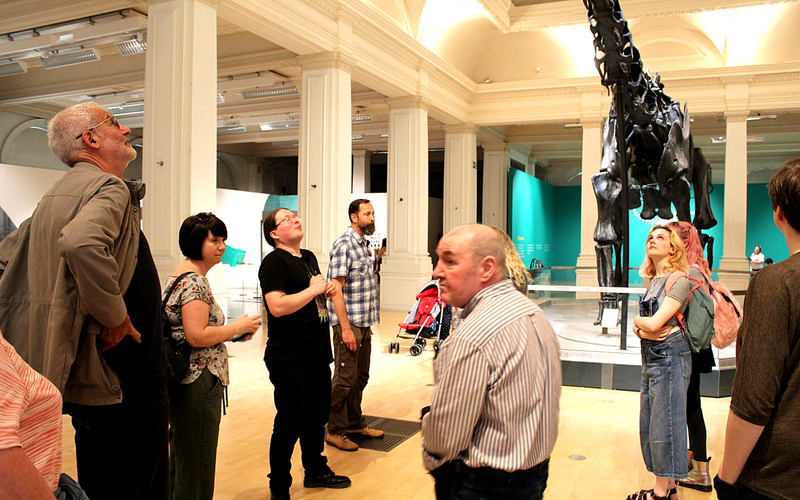 It was a joy to see so many families visit Dippy on the day we joined the tour. 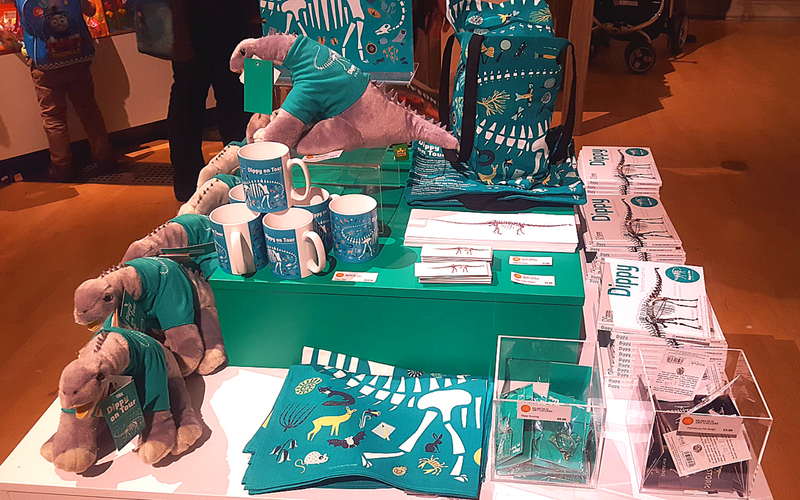 There is an incredible range of merchandise if you would love a memento of seeing one of the biggest creatures that ever existed. 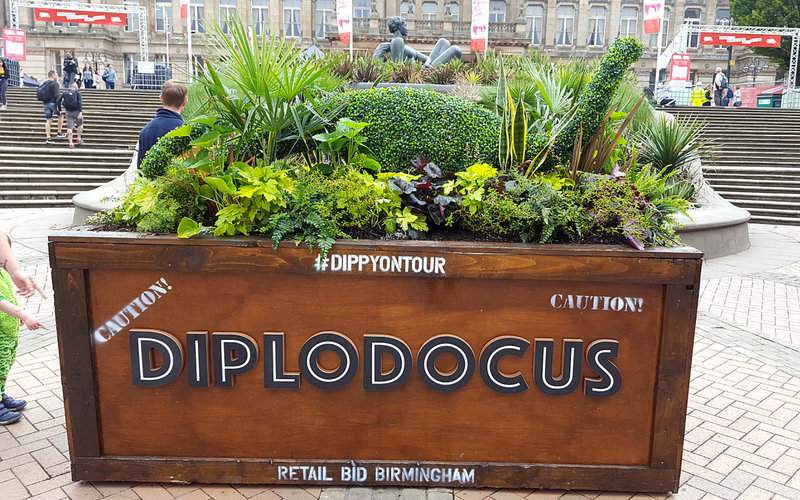 If seeing Dippy whips you into a dino-frenzy then a fun way to enjoy more dino fun is to hunt down the 10 topiary dinosaurs dotted around the city centre for the BIG IN THE CITY Dino tour.